Charles Rennie Mackintosh (7 June 1868 – 10 December 1928) was a Scottish architect, designer and watercolourist. He was a designer in the Arts and Crafts movement and also the main exponent of Art Nouveau in the United Kingdom. He had a considerable influence on European design. Art is the Flower - Life is the Green Leaf. Let every artist strive to make his flower a beautiful living thing, something that will convince the world that there may be, there are, things more precious more beautiful - more lasting than life itself... you must offer real, living - beautifully coloured flowers - flowers that grow from, but above, the green leaf – flowers that are not dead – are not dying – not artificial – real flowers springing from your own soul – not even cut flowers - You must offer the flowers of the art that is in you – the symbols of all that is noble – and beautiful – and inspiring - flowers that will often change a colourless leaf - into an established and thoughtful thing. 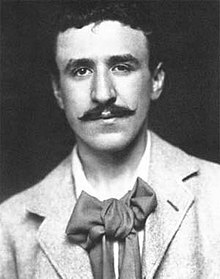 (J. D. Sedding's) aphorism 'There is hope in honest error, none in the icy perfection of the mere stylist' became a personal motto for Mackintosh. The quote is sometimes misattributed to Mackintosh himself. This page was last edited on 11 March 2018, at 00:12.